​In addition there will be NO TRAINING on 19th & 21st April (Easter weekend) with the exception of a Bronze Award test on Friday 19th. ​Due to the numbers in all of our Bronze Award classes, progression into these will need to be discussed as each Handler & Dog completes the Puppy Foundation level. ​We have a waiting list for our Puppy Foundation, but spaces become available as Handlers and Puppies complete their Training. The Sunday Training is the most popular and therefore has a longer waiting list. As we have a large number of people at the present time completing the Puppy classes, we have a restricted entry into the Bronze class (see note opposite). 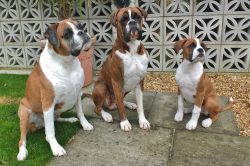 Puppy Foundation: Following a prescribed recorded Training programme of exercises, covering socialisation and the foundation of basic skills required in daily and home life situations, including the responsibilities involved with Dog ownership. Training will follow exercises found in the Kennel Club Good Citizen Dog Scheme Puppy Foundation. This Training course is designed as an introduction to the basic dog training exercises needed in everyday situations, which many people find sufficient for their immediate needs, or as preparation for Bronze Award Training. Please note that our Puppy Training sessions operate on a "continuous" basis, working at each Handler & Puppies pace allowing time to re-enforce the basic commands as opposed to a set "timed" course which can be time restrictive. Please note that direct entry to this level without progressing from the Puppy Foundation is very restricted, due to the numbers of people who wish to continue after the Puppy Training. Intermediate/Silver Award: For Dogs and Handlers that have been through previous Training and wish to develop and extend the basic socialisation and Training skills beyond the basics. Will include exercises found (but not limited to) the Kennel Club GCDS Silver Award. We have limited this level to a Sunday at present, to cater for the outdoor exercises required. Advanced/Gold Award: For Dogs and Handlers that wish to be involved in Training activities at an advanced level including those found at (but not limited to) the GCDS Gold Award. We have limited this level to a Sunday at present, due to the number of outdoor exercises required. Training sessions have been organised to also include exercises that promote Training for every day situations to make Dog ownership a happy and pleasant experience for both you and your Dog. We concentrate on working at each Handler and Dogs pace, developing handling skills to provide consistent lasting quality results. As well as producing proof of current vaccination when starting Training, it is expected that each handler must carry with them some form of “poop scoop” and all dogs must wear a collar and Identification tag/disc/plate complying with the law: Name, address, & post code. (It is advisable to have as many telephone numbers as you can get on the tag/disc/plate). Parents are reminded that a Dog Training environment is not always suitable for young children and therefore children should be closely supervised by an experienced adult on a one to one basis. ​All children should be instructed on the safe codes of practice when handling or being near Dogs, such as described on the Kennel Club website "Child safety around Dogs" HERE or on our website page "Children & Dogs"
​All new Dogs will be assessed during the first few weeks of Training to make sure that they do not exhibit any abnormal or aggressive behaviour which could cause concern to other Members and their Dogs. Should this occur,you will be advised to seek specialist behaviour Training, which unfortunately we are unable to offer.